Vasquez lives – and the charismatic actress being the smart-gun toting marine is armed against extraterrestrial trouble. 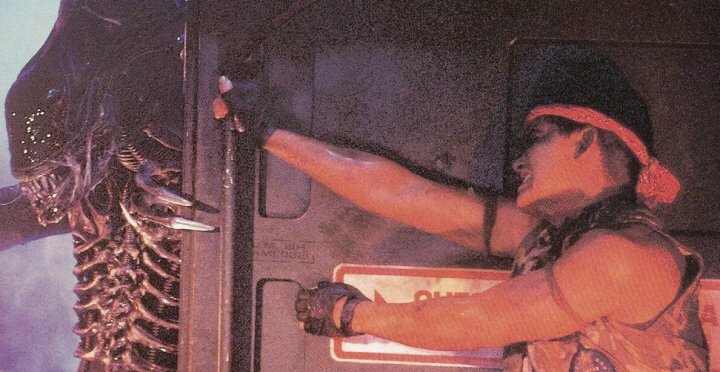 Somewhere, beneath the makeup, sweat, ferocity and courage that made up Private Vasquez, the rippling heroine of Aliens, there’s a soft-spoken, freckled, 5’2″ woman named Jenette Goldstein. Goldstein, to her credit as a performer, shares precious little with her scene-stealing character; in fact, had the film been a true representation of the 26-year-old actress, it might have been titled Beverly Hills Marine. Yes, far from the gritty deprivation of Aliens, the actress was raised in that much publicised community. Despite growing yo so near the glamour of Hollywood, the trappings of celebrity remain foreign to Goldstein. She enjoys the anonymity, and she’s still a bit amused by the flood of fan mail she received – ranging from the US Marine Corps to often offers of marriage (to late, but more on that later) to a seven-year-old girl who wrote to Vasquez, inviting her to stay in her home if she ever got out that way. Ironically, Goldstein had ventured for from home when she took her first toward joining the rather exclusive club that makes a living in front of the cameras. Goldstein began acting in high school, and, after going to college in Santa Barbara, left to study in New York on a two-year program. She them met and married an Englishman, following him to London to attend drama school. Three years later and numerous stage appearances later, in small productions ranging from Shakespeare to musicals, she answered an ad for a film role in the local trades. It read simply, “Genuine American actors, British Equity, for feature film Aliens, 20th Century Fox,” she relates, over lunch near the old homestead of Beverly Hills. Since she didn’t have an agent at the time, she answered on her own, with rather surprising results. “I actually came in wearing high heels and lots of makeup, and I had waist-length hair,” she says. Other auditioners, who had advance notice from their agents, were decked out in military fatigues – Goldstein’s first inkling she would be reading for the role as a marine. Getting to grips with the smartgun. Physical preparation, however, presented only part of the challenge. Golstein also had to capture Vasquez’s anger, dialect and martial mentality. Sequencing did come as a shock. The introduction to the marines, for example, as they awake from hyper space and gnaw on breakfast, was filmed at the production’s end. That way, the cast had several months to get acquainted. By then, Goldstein had already befriended Mark Rolston, who portrayed Drake – Vasquez’s huge, blond compatriot, who comes down with severe case of Alien-induced acne in the first confrontation. Though military life isn’t exactly her idea of a good time, she felt at home among the mostly male company. “I grew up with brothers, so I was used to it,” she says. Like most great films, Aliens possess a richness of detail that can’t be absorbed in one viewing. Director Cameron prepared a background dossier on each character, and the actors personalized their uniforms in the spirit of their characters. Goldstein, appropriately, scribbled the phrase “Adios” on her gun, signifying the last word someone who crossed her would hear. On the back of her shirt, it said simply, “Loco”. Still, the actress does admire Cameron’s deft handling of female characters, even those in (literally) short-lived roles. “All the woman’s roles were good, particularly the little girl (Carrie Henn). Little girls are usually shown to be such idiots,” she notes. 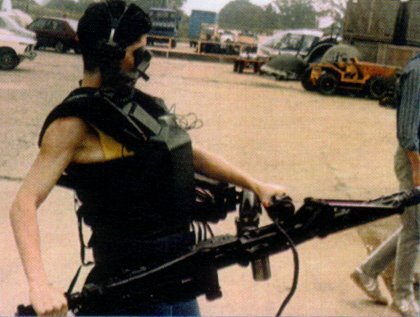 On the Hive set with fellow smartgunner, Pvt. Drake (Mark Rolston). Drake and Vasquez: smartgunners, juvenile hall recruits, and “dobermans at play”. Space, firearms and slime may not figure prominently in her immediate plans, but Goldstein hopes Vasquez’s death won’t be in vain. With a little luck, that brief sojourn into space may have put Jenette Goldstein on the path toward becoming an earthbound star. Originally published in Starlog #115, February 1987. Well the article actually got something wrong — the gun that was used as the basis for the smartgun wasn’t an anti-aircraft weapon at all. It was the German MG42 7.9 mm general-purpose machinegun, occasionally referred to as “Hitler’s buzzsaw” because of its absurd 1200-1500 RPM rate of fire. By comparison: the Vietnam-era M16 assault rifle and the modern-era M249 SAW light machinegun fire at around 800 RPM. Though the MG42 could be mounted on a tripod, it could also be carried by a single soldier or used on a bipod. Other than that, I like the article, because it points out one of the things that I liked about Aliens: male and female combat troops shed the same blood in the same mud, and nobody made a big deal about it except Hudson (“Have you ever been mistaken for a man?”) — but then, but he made a big deal about everything). 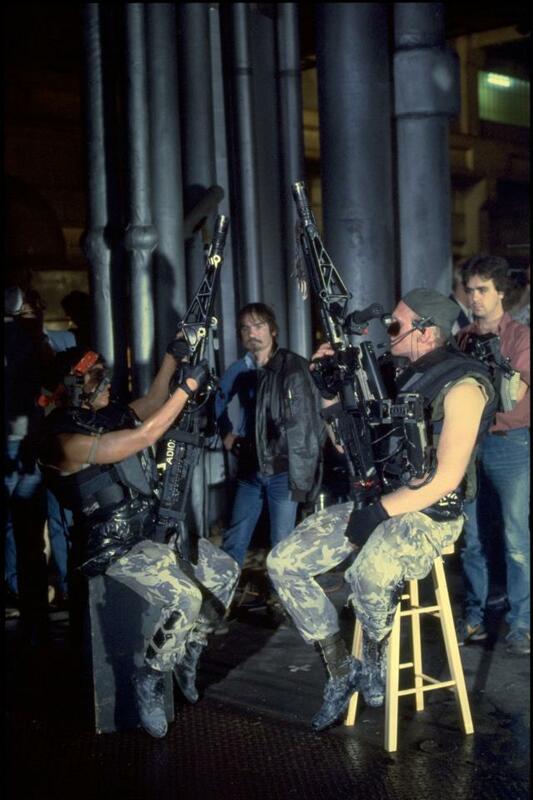 if somebody tells Vasquez to take point, they’re doing it because she’s a soldier first, a woman second, and taking point is what soldiers do sometimes (although it’s pretty stupid to have your heavy support gunner take point!). The MG42 was used in anti-aircraft roles. That gun is bigger then she is. Reblogged this on Mercian Media. I’d be shocked if she wasn’t on anabolic steroids at the time.